Adventure re-invented! The Kang Shung valley is one of the most remote trekking destinations in central Tibet. Even though this trek requires some stamina it is definitely worth doing. You will find some of the grandest Himalayan sceneries on this spectacular walk, which takes you along steep-sided valleys and glacial lakes. In the summer the magnificent grassland flowers are in bloom in the remote Kangshung valley, which is also dubbed the Valley of Flowers. The roundtrip walk of 8 days to the East Mount Everest Base Camp begins at Yuba. The valley absolutely roars with the summer monsoon, the snow that accumulates daily on the peaks starts rumbling about noon and continues to fall noisily throughout the most nights. which is the capital of the Tibet Autonomous Region in the People’s Republic of China. It is located at the foot of Mount Gephel and is one of the highest provincial capitals in the world. It is the location of the Potala and Norbulingka palaces (both are included as World Heritage Sites and is the birthplace of Tibetan Buddhism. The Jokhang in Lhasa is regarded as the holiest center in Tibet. Lhasa literally means “place of the gods”. At an altitude is 3,490 metres (11,450 ft), Lhasa is one of the highest cities in the world, covering a flat river valley in the Himalaya Mountains. Overnight in hotel. Lhasa has many sites of historic interest, including the Potala Palace, Jokhang Temple, Sera Monastery, Zhefeng Temple, Drepung Monastery and Norbulingka.The city of Lhasa contains three concentric paths used by pilgrims to walk around the sacred Johkhang Temple, many of whom make full or partial prostrations along these routes in order to gain spiritual merit. The innermost, the Nangkor (Nang-skor), is contained within the Jokhang Temple, and surrounds the sanctuary of the Jowo Shakyamuni, the most sacred statue in Tibetan Buddhism. The middle circumambulatory, the Barkor (Bar-skor), passes through the Old Town and surrounds the Jokhang Temple and various other buildings in its vicinity. The outer Lingkor (Gling-skor) encircles the entire traditional city of Lhasa. Overnight in a hotel. Ganden Monastery (also Gaden or Gandain) is one of the ‘great three’ Gelukpa university monasteries of Tibet, located at the top of Wangbur Mountain. It contained more than two dozen major chapels with large Buddha statues. Overnight in hotel. Salu Monastery or Shalu Monastery is a small monastery 22 km south of Shigatse in Tibet. For centuries it was renowned as a centre of scholarly learning and psychic training and its mural paintings were considered to be the most ancient and beautiful in Tibet. Shigatse is the second largest city in Tibet. Shigatse contains the huge Tashilhunpo Monastery, founded in 1447 by Gendun Drup, the First Dalai Lama. It is the traditional seat of the Panchen Lamas.The imposing castle, Samdrubtse Dzong or “Shigatse Dzong”, was probably built in the 15th century. It looked something like a smaller version of the Potala, and had turret-like fortifications at the ends and a central Red Palace. From here the spectacular trek starts. We follow trails through conifer and rhododendron forest, past sacred lakes and across the verdant yak grazing pastures set beneath a backdrop of Lhotse, Makalu and the huge Kangshung Face (East Face) of Everest. During your trek in tents our cooks will surprise you with a varied menu that’s sure to please at the conclusion of each trekking day. Overnight in camp. After loading our gear we head off on the first stage of the trek following a well defines track alongside the Kharta River before ascending above a series of small settlements set amid barley fields.The lower trail continues up valley eventually diverting to the Langma La, while we follow the upper trail that ascends steeply in places towards the valley leading to the Shao La. There are good views back down the valley. In particular we can appreciate the forested hillside to the south of Kharta village that marks the upper limit of the monsoon. Our trail then leads to the substantial village of Lunrubling as we leave Yuba village and the site of our first camp (3650 metres). The trail ascends a series of ‘glacial steps’ before reaching a series of glacial lakes at the head of the valley located at the base of the Shao La (4700 metres). We gain our first views of Everest (8848 metres), Makalu (8475 metres) and Lhotse (8501 metres). From the valley floor there is a steep 300 to 400 meter ascent through the conifer forest to a ridgeline high above the Kama Tsangpo Valley. From here we get magnificent views south towards the Arun Gorge and Nepal. Our trail then crosses alpine ridges that support the summer camps of yak herders’ from Kharta village. We also pass a series of beautiful lakes before ascending a ridge and gaining our first uninterrupted views of the Kangshung Face of Everest. We’ll set up camp in one of the idyllic meadows. Depending on the selection of the camp it will take just a few hours to descend to the camp at Pathang Ringmo at 4,550 metres, a beautiful meadow camp beneath the impressive peak of Chomo Lonzo [7,790 metres]. If you feel fit you can walk up to the sacred lake immediately above the camp. The trail heads up the hillside to the north and it takes about 40 minutes to reach the lake. At the far end of the lake is a Sacred Cave, which is said to be one of the many places where Padmasambhava, the lotus-born Buddha, meditated during his journeys through Tibet. Within the cave are a number of simple shelters and prayer rooms, where pilgrims normally make offerings. From Pathang Ringmo the trail heads across the meadow before ascending across a loose scree slope that can cause difficulties for the laden yaks. The climb up and across the scree slopes is tiring and it is good to get back onto the more established shepherd trails. Rounding the hillside the Kangshung Face of Everest comes again into view, while across the valley the impressive glaciers at Chomo Lonzo can also be appreciated. Our camp at Hoppo is situated amid yak pastures at [4800 metres]. 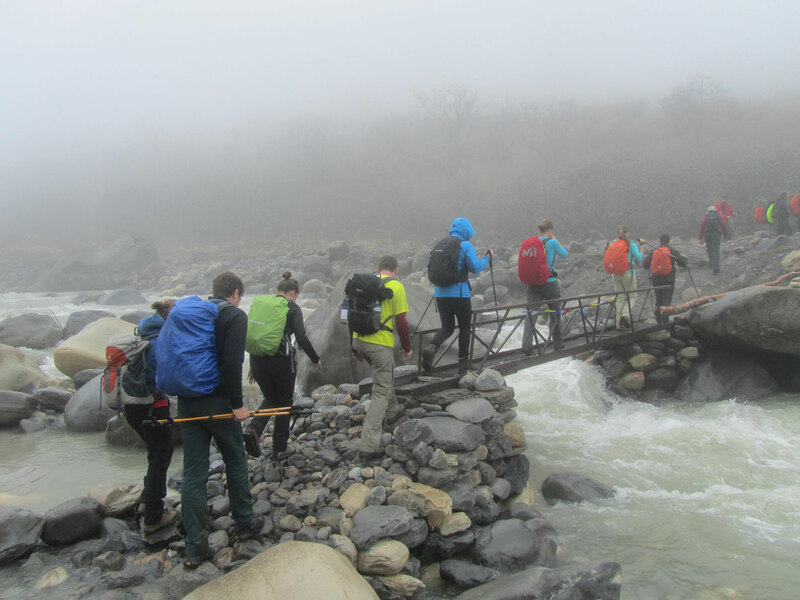 The trek to Kangshung Base Camp [5,050 metres] can be completed in a couple of hours. The trail gradually ascends the grassy ridges to the snout of the Kangshung Glacier. As we view the huge face it is not difficult to understand why it has only been attempted by a handful of expeditions and a copy of Stephen Venables book “The Kangshung Face” is a must. From our vantage point, the impressive North East Ridge of Everest is also seen. We return to Hoppo and stay overnight. The trail from Pathang Ringmo heads back down the valley before diverting north towards the Langma La. It leads gradually across the yak pastures and en route we gain views of the impressive Himalayan range, in particular the summit of Makalu. Our camp at Shurimo (4,800 meters) is located at the base of the pass. The climb to the Langma La takes about two hours. From our camp we climb a well-graded trail with further views of Everest, Lhotse, and Makalu. From the pass [5,330 metres] there is a steep descend to the valley floor. As the valley opens out we pass yak herders’ camps from Kharta and the nearby villages. We head down to the confluence of the Kharta Valley and gain views of the Kanchenjunga massif rearing above the ridges beyond Kharta on the Nepal- Sikkim border. Our trail then leads past the substantial village of Lundrubling, where we make camp. Today is the final day of our Tibet trekking tour and we return to Kharta. We make camp here for the final night of our trekking and share the memories… and prepare to drive to Zhangmu in the morning. For our trip back to Kathmandu (123km) through the beautiful Nepalese countryside to Kodari at the Nepal- Tibet border. Zhangmu is a customs town and port of entry located in Nyalam County on the Nepal – Tibet border, just uphill and across the Bhote Kosi River from the Nepalese town of Kodari. At 2300 meters above sea level, Zhangmu has mild and humid subtropical climate, which is a rarity for Tibet. Trucks traveling on the Friendship Highway offload goods at Zhangmu and transfer them to trucks from the opposite country. The single narrow zigzag street of Zhangmu makes this an especially difficult operation, but it is a very interesting experience! After completing the border formalities at both the Nepalese and Chinese immigration posts, we drive to Kathmandu (5hrs).